What's Ahead for Clean Water Act Enforcement? The November 8, 2016, election will be long-remembered. Although the result was surprising to many, it was largely driven by rural Americans seeking change to the status quo. But, what will a new Administration actually mean for rural America? If this election taught us anything, it taught that predictions aren’t often worth a whole lot. Even so, as the dust settles, it may be helpful to consider the potential impact of the election on several major policy issue facing agriculture. In the days ahead, we'll begin to look at the details of various tax proposals. No doubt 2017 will likely see major tax reform begin to unfold. Likewise, we face uncertainty regarding trade deals, the 2018 Farm Bill and many other issues important to agriculture. But today I'm going to focus on the enforcement of the Clean Water Act, one of the most ardent concerns raised by landowners during the past several years. Rural America has been concerned about the seemingly expanding reach of the Clean Water Act (CWA). Landowners argue that this jurisdictional expansion threatens their rights to use their lands as they choose. This was an issue discussed frequently during the campaign season. In light of new leadership, 2017 may bring some changes. The modern CWA was passed by Congress in 1972 to restore and maintain “the chemical, physical, and biological integrity of the nation’s waters.” Generally, the CWA prohibits the discharge of any pollutant or fill material into “navigable waters” without a permit. Section 402 authorizes the EPA to issue permits for discharges of “pollutants” through a “point source.” These NPDES permits are issued for activities including the discharge of municipal and industrial wastewater and the discharge of manure and wastewater from certain animal feeding operations. In Iowa, the Iowa Department of Natural Resources issues these federal permits through a cooperative agreement with the EPA. Section 404 authorizes the U.S. Army Corps of Engineers to issue permits for the discharge of dredged or fill material into “navigable waters.” In practice, these permits are required if a landowner wants to conduct most any activity on an area determined to be a “wetland.” And these permits are not cheap. An average individual permittee spends 788 days and $271,596 to obtain a 404 permit, without counting the cost of mitigation or design changes. People who discharge pollutants or fill material without obtaining a permit face fines up to $37,500 per day per violation, in addition to potential criminal penalties. 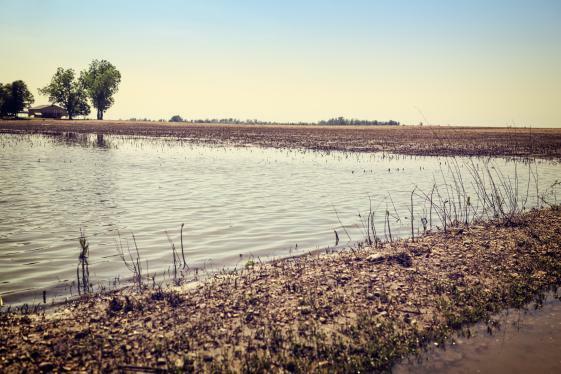 Although the CWA contains agricultural exemptions, farmers may not drain “wetlands” that have not already been farmed to plant crops. Not only would they face fines under the CWA, they would also lose their eligibility for farm program benefits. But how can land not located around a river or stream be subject to a law that prevents the pollution or contamination of “navigable waters”? Therein lies the ambiguity of the CWA. Congress defined “navigable waters” as the “waters of the United States, including territorial seas.” The EPA and the Corps must interpret this phrase, which they have condensed to “waters of the United States” (WOTUS). In 2006, the U.S. Supreme Court ruled that the Corps’ definition of WOTUS—which turned on whether a wetland was “adjacent” to other WOTUS—was too broad. The case involved a 54-acre parcel of land 11 miles from the nearest navigable water. The landowner backfilled the property to prepare it for development. The Corps alleged that the activities required a permit, and the owner faced huge fines and prison time. Although five justices (a majority) determined that the Corps’ definition was too broad, they could not agree on a single rationale. Four justices reasoned that only those wetlands with a continuous surface connection to other WOTUS were jurisdictional. However, Justice Kennedy wrote that whether wetlands were WOTUS depended upon whether they possessed a “significant nexus” to other CWA-regulated waters. “Significant nexus” became the de facto test that has caused confusion since. In May of 2015, the EPA and Corps issued the Clean Water Rule, a regulation attempting to more clearly define WOTUS. The new Rule, however, seems to have expanded, rather than clarified, the definition. Distinguishing between “tributaries, “adjacent waters” and “neighboring waters,” the Rule seems to sweep into CWA jurisdiction remote wetlands that happen to be in the 100-year floodplain of other jurisdictional waters or land where water flows only occasionally after a heavy rain. The majority of States and many industry groups immediately sued the agencies, alleging that they were seeking to regulate land and water falling wholly under the jurisdiction of the states. In October of 2015, the U.S. Court of Appeals for the Sixth Circuit “stayed” the Rule, meaning that it could not be enforced until the lawsuits were resolved. The parties are still briefing their arguments. A new President means a new Cabinet and new heads of key agencies. President-elect Trump has stated that he will appoint a “pro-farmer” EPA Administrator. As of today, that appointment has not been made. But new solutions won’t come overnight. The new Administrator could seek to repeal the embattled Clean Water Rule. This would end the protracted litigation and allow the EPA to work on creating new guidance defining the jurisdictional reach of the CWA. Writing this new guidance, however, would take many months. And, once new rules are proposed, they would be subject to a notice and comment period before becoming effective. Congress, which will likely be busy pursuing other new initiatives, such as tax reform, could pass legislation to more clearly define the meaning of “navigable waters.” The majority of both houses of Congress, as well as the President-elect, would likely support legislation to make the definition more restrictive. If 41 senators were opposed to a new definition, however, the legislation could meet a filibuster. Finally, the Supreme Court has weighed in on the jurisdictional reach of the CWA multiple times and could do so again down the road. Four of the five Justices who declared that the 2006 definition was overbroad are still on the Court. Justice Scalia, one of the five, passed away last February. President-elect Trump will name his successor, who must be confirmed by the Senate. Justice Kennedy, the Justice who crafted the “significant nexus” test, stated in a case last April, “The reach and systemic consequences of the Clean Water Act remain a cause for concern.” It “continues to raise troubling questions regarding the Government’s power to cast doubt on the full use and enjoyment of private property throughout the Nation.” These are strong words that perhaps indicate an understanding of the difficulty the “significant nexus” test has caused in practice. We’ll keep you posted as 2017 unfolds. It should certainly be an interesting year.